For this final post in the series, I arranged to discuss perspective, and how growing more gratitude and having less guilt in your life can help to greatly reduce stress. I grew up living on a lagoon near the San Francisco Bay that would flood easily in years when El Nino really gave a fantastic show, or the pump attached to the bay went out. Instead of letting the tears flow, I’d watch as my mom would study the muddy colored waters and say, “It’s time.” Time to roll up carpets, evacuate furniture to higher ground, and to call the piano player, if he was in town. You see, she’d call neighbors to help and in their kindness, they’d show up with food and drinks, and sometimes a relative with great skill on the piano. Only she could turn a terrifying jaunt with 100 mile per hour winds and rising waters licking the edge of the deck into a party! It’s funny how when you write about something, it often is the thing you need the most or cherish the most in that specific time. This week, I’ve sat with a new friend who’s just lost everything physical in a fire. In reaching out to help her, I find myself greeted with smiles and wisdom anew. Unexpected grace. In the press of multiple commitments for the kids, it reminds me too of how to breathe and take a walk and taste beauty to be sustained. Landing somewhere between these moments, I’ve got two nuggets with tangible results in the stress-reduction department to share with you. Whether it’s a series of frames around photos of key moments, or a wall full of notes with specific instances in mind, having a tribute to the biggiest things in life is a great legacy to leave your children, and doesn’t hurt to remind us about our own thoughts to ensure we’re on track. I’ve posted many great ideas on my Pintrest HERE, from tree branches with notes pinned to them, to whole walls painted in blackboard paint so you and the littles in your life can write up daily praises. It’s a visual bookmark in the fabric of life that gives more stretch and texture to the most challenging moments, too. And last summer, we made a gratitude website so our kids would know of kindness to us during our rebuilding after the fires, called MAKEUSSMILE.COM. Become more attune to your physical and other limits, and allow yourself permission to pass on things that don’t bring great value to your life right now. Maybe your kids need a break, too, and could use some grace bombs, as we call them HERE. I find we have seasons of intense involvement, and these need to be followed by a pattern of less, like the space between squares on an intricate quilt. That room to breathe. To regroup. To forgive. To relive. To revive. To let the sauce thicken so the dishes we cook are celebratory rather than merely scarfed down. While we’re not quite there yet, it helps to identify these goals and discuss them together. Somehow, my kids are always ready to play or celebrate the moment, much like their Grandmother. No floods are rising here, but whether dusting off ashes or reaching for new milestones, the legacy from those waters receding is real. 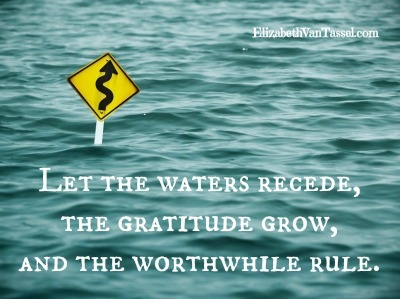 And a wonderful post by Jeanne Takenaka about building grace into the fabric of your family in everyday habits Gratitude. Please share your ideas here! I hope these 10 strategies have made a difference for you and your families!